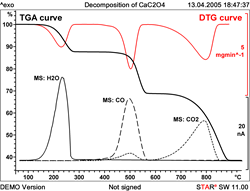 Thermogravimetric analysis (TGA) measures the quantitative change in sample mass as a function of time or temperature, but TGA cannot characterize gaseous products that evolve during the process. A free webinar from METTLER TOLEDO will explore the advantages of “TGA plus” measurements and offer a chance to ask application questions. TGA-EGA has applications in a wide variety of industries, including food, pharma, academia, engineering/manufacturing, mining, and test labs. METTLER TOLEDO is pleased to present “Evolved Gas Analysis (EGA) in Thermal Analysis” on May 26th, 2016. The English-language presentation is part of the leading lab technology company’s year-long thermal analysis webinar series. Covering EGA principles, technology and applications, the presentation will repeat live three times to allow participation from around the globe. For a list of times and to register, please click here. TGA-EGA has applications in a wide variety of industries, including food, pharma, academia, engineering/manufacturing, mining, and test labs. It is used in research, development, and quality control to explore actions such as thermal degradation, vaporization, sublimation, and starting materials/end products characterization to investigate materials composition or failure. Detecting residual solvents. Many pharmaceutical products contain residual solvents—some of which cause safety concerns. TGA-MS can identify undesired residues, allowing for reaction improvements that help eliminate them. Defining thermal behavior. TGA-FTIR analysis can be used to determine at what temperature corrosive substances are formed when heating polymers. This helps to assess, for example, if cable insulation will attack metal connections at standard operating temperatures. Determining state changes. TGA-EGA can also provide a sensitive method to determine the temperature at which the first irreversible temperature-related change (delamination) occurs in complex materials such as printed circuit boards. Representative measurement applications and forward-thinking TGA-EGA measurement possibilities will also be reviewed. To learn more, register for this or another METTLER TOLEDO thermal analysis webinar. We also welcome you to access our free on-demand thermal analysis webinars or dedicated thermal analysis e-training.